The SC-LCD screen should handle web pages better (since they are predominantly white, not a good scenario for AMOLEDs) and the chipset is clocked 200MHz lower, which might give the Galaxy R a crucial advantage when it comes to battery performance. Let’s find out. We crunched the numbers and the Samsung Galaxy R lasted 9 hours and 40 minutes of 3G calling. That beats the official estimate of 9 hours and is about an hour longer than the S II managed. This result puts the Galaxy R just above the HTC Sensation XL. The web browsing test took 5 hours and 7 minutes before the Samsung Galaxy R’s battery gave out. This beats the result that the S II posted by about 40 minutes. This makes the Galaxy R an above average performer. 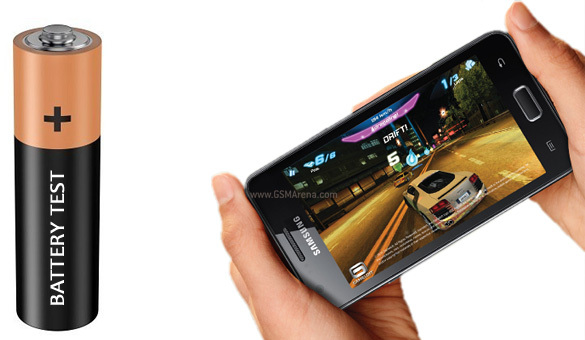 Video playback was the one test that the Galaxy R lost out to the S II. With a time of 6 hours and 21 minutes, the R is far from the top performers in this field (which last 8+ hours), but still beats the majority of phones we’ve tested. In a balanced diet of one hour of 3G calls, one hour of web browsing over Wi-Fi and one hour of watching videos each day the Samsung Galaxy R will last 36 hours on average before you have to go looking for a socket. 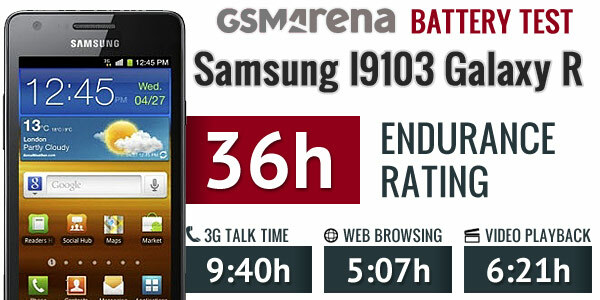 This is below the 40 hours endurance rating that the Galaxy S II scored, but if calling and web browsing are your priorities, you can squeeze out more battery life of the Galaxy R than of the S II.